In the post Updating Google Calendars from a Google Spreadsheet, I described a recipe for adding events to a Google Calendar from a Google Spreadsheet using Google Apps Script. After a quick chat with the person who was compiling a spreadsheet they wanted to use to populate a set of calendars, I revisited the script to make a few tweaks and hopefully increase its usability. Within the spreadsheet, I set the two date columns to have the Date type (from the Tools menu, set the Data Validation option to Date). I’m not sure how the spreadsheet is (correctly) identifying the US date format (MM-DD-YY) – maybe from a US timezone as a global setting for the spreadsheet? From what I could ascertain, the way the spreadsheet is supposed to work goes along the lines of: someone adds details of an event and the associated channels for the event to the spreadsheet. “Add” in a channel column says that event is to be added to that channel calendar. When the updating script is run, for each event it checks the control column A to see that an event hasn’t been added to the various channel calendars, and if it hasn’t checks the channel columns; if a channel column is set to “Add” the event details are added to that event calendar. var broadcast=row[col_broadcast]; // is this event one to "Add" to the broadcast calendar? var sheet=SpreadsheetApp.setActiveSheet(ss.getSheets()); //need a routine to set active sheet by name? 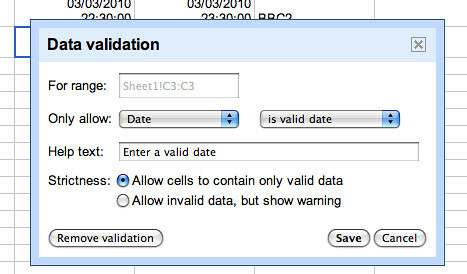 Running the combined function thus searches the spreadsheet for the appropriate channel columns and control column, checks the control column for each event entry to ensure that the event hasn’t been added to the selected calendars, and then adds the event to the appropriate channel calendars if required. Having doodled a script that sort of works, it’s now time to hack it around it so it looks a little more elegant. Which means refactoring.. sigh… and another reprise in a day or two, I guess…?! So now not only can we use a spreadsheet as a database we can also use a calendar in a similar way, and if necessary, link them all together? 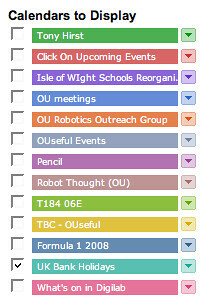 We’re in the process of creating a master calendar of events spreadsheet relevant to [various things]. These [various things] will all then have their own Google calendar so they can be looked at individually, embedded etc and everyone could of course have access to all and view them all via their personal Google calendar, turn different calendars on or off, sync with Outlook etc. etc. X said “wouldn’t it be great if we made the master spreadsheet with Google docs and it could somehow automate and complete the calendars”. Sigh…;-) So – is it possible? 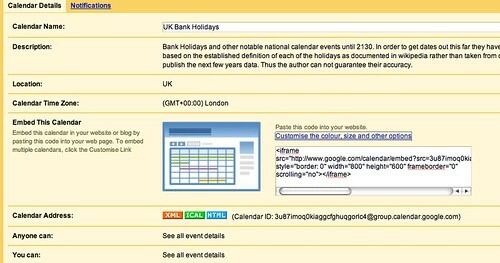 The email tutorial adds a bit of gloss that allows a further column to contain state information about whether an email has already been set; we could do something similar to specify whether or not an event has been automatically added to the calendar, and if not, add it when the function is run. PS Arghh… the test formula assumes a Date type is being passed to it… Doh! 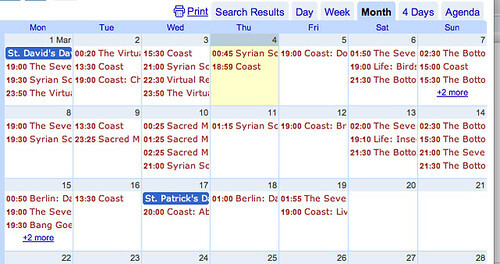 PPS it strikes me that the spreadsheets2calendar route provides one way of generating an iCal feed from a list of event times held in a spreadsheet, by popping the events into a Calendar and then making the most of its output formats? 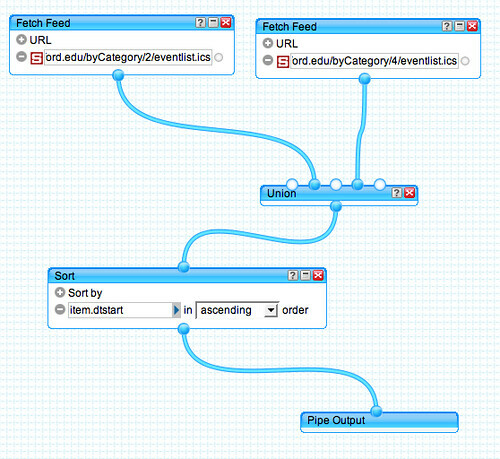 A bit like using Yahoo pipes as a quick’n’easy KML generator? 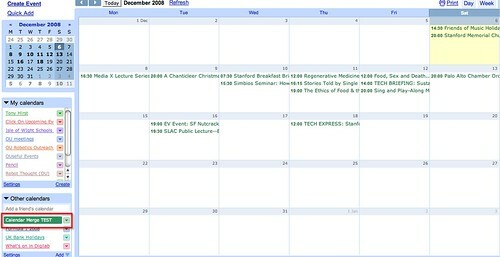 You can then render this feed in an online calendar such as 30 boxes: pipes merged iCal feeds in 30 boxes (here’s the 30 boxes config page for that calendar). 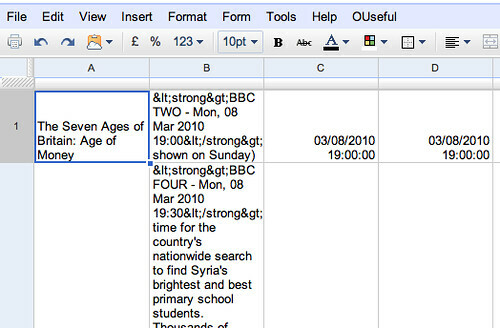 Using the Pipe’s output iCal URL to try to add the merged calendar feed to Google Calendar didn’t seem to work, but when I converted the URL to a TinyURL (http://tinyurl.com/67bg2d) and used that as the import URL, it worked fine. PS having to add the feeds by hand to the pipe is a pain. So how about if we list a set of iCal feeds in an RSS feed (which could be a shared bookmark feed, built around a common tag), then pull that bookmark feed (such as the feed from a delicious page (e.g. 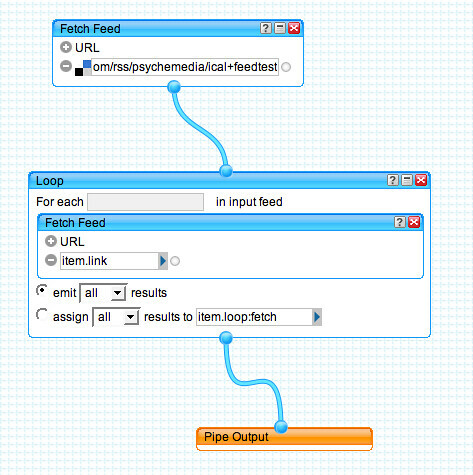 http://delicious.com/psychemedia/ical+feedtest)) into a pipe and use it to identify what iCal feeds to pull into the pipe? Got that? 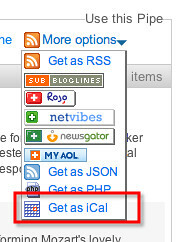 The Loop block grabs the URL for each iCal feed listed in the input RSS feed, and pulls in the corresponding iCal events. 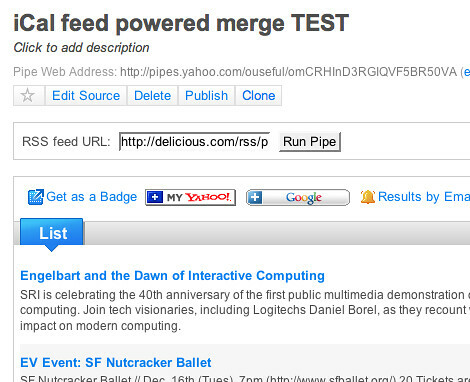 It seems to work okay, too:-) That is, the feed powered iCal merge pipe will aggregate events from all the iCal feed listed in the RSS feed that is pulled into the pipe. – take the feed from that common somewhere and pop it into the feed powered iCal merge pipe. – get the TinyURL of the iCal output from the pipe, and subscribe to it in Google Calendar, (for a personal calendar view). 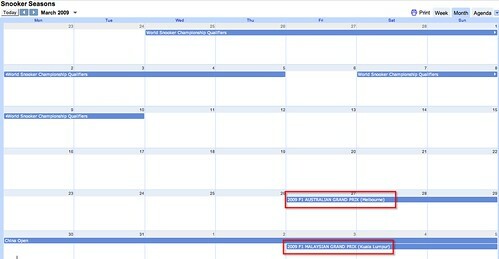 Hmm… we still can’t publish the Google Calendar though, because we don’t “own” the calendar dates (the iCal feed does)? 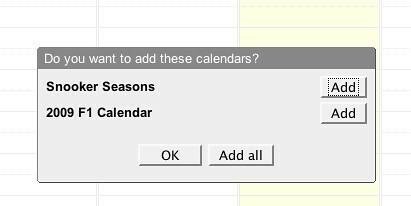 But I guess we can still use 30boxes as the display surface, and provide a button to add the calendar to Google Calendar? Hmm, it would be nice if Pipes also offered a “calendar” output view when it knew there was iCal data around, just like it generates a map for when it sniffs geo-data, and a slideshow view when it detects appropriately addressed media objects? Any chance of that, I wonder? while I was admiring the new link to UMW Blogs on the UMW homepage, I clicked on the Events link, and to my surprise it was a Google calendar. Wow! Who knew? When looking at the source code, I released it was actually an aggregation of 10 different Google Calendars–all the more fascinating. Err… rewind one moment… “When looking at the source code, I released it was actually an aggregation of 10 different Google Calendars“…? – Snooker Championships Listing (some events are listed over the next four months or so). – Formula One Grand Prix listings for 2009 (the events start during March, 2009). 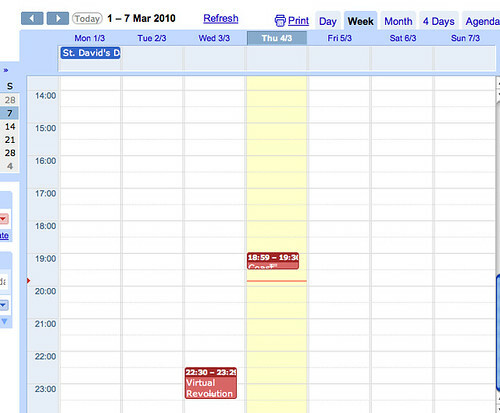 Now look through to March on this calendar: aggregated calendar view. It shows events from both calendars in the same view. So what we have here is an aggregated calendar view that can be used to display several (that is, multiple) Google calendar feeds in a single view. 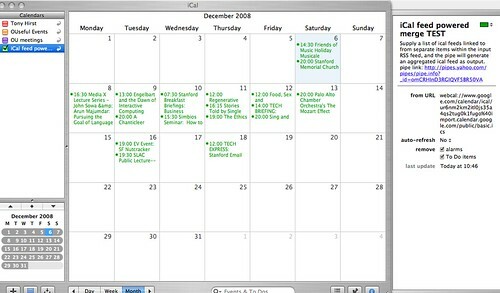 To embed the calendar in your own page, just stick it in an iframe. 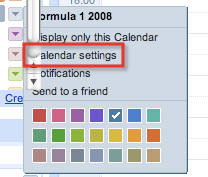 That is, it looks like each calendar feed will be added separately, rather than as a single, combined calendar.